I’m mad at Syfy. They gave me the first eight episodes of 12 Monkeys season two several weeks ago. And since I watched those episodes, I’ve been on tenterhooks. If you thought 12 Monkeys was fascinating and crack-like in its first season, then you’re going to have a problem when season two starts tonight. No spoilers here! 12 Monkeys started out as a TV adaptation of the beloved Terry Gilliam movie of the same name, which in turn was an adaptation of the weird French narrative slideshow La Jetée. The basic idea is the same: A guy named James Cole goes back in time from a plague-stricken future, but the present day is full of crazy people, cultists and shadowy conspiracies. But season two makes it clear that 12 Monkeys is growing way beyond its original mandate, which is probably a good thing for an open-ended TV show. There’s only so long that you can string out the “will they/won’t they stop the plague” storyline, before it becomes an endless series of “we almost stopped it this time” moments. Instead, season two of Monkeys doubles down on the time travel. There are more inventive uses of time, including shifting timelines, but the show always manages to make the consequences of time travel seem concrete rather than abstract—which is probably the acid test of temporal shenanigans on screen. Just like that season one episode where Cole changes the wrong thing in the past and suddenly his dystopian future is a lot more dystopian, there are moments when the timelines are altered with surprising consequences. Not all of the time-wrangling on 12 Monkeys entirely makes sense (as per usual) and not all of it entirely works. But most of it does work well enough to be emotionally enthralling, and a handful of the show’s clever ideas in season two are real standouts, that people will be freaking out over in a few weeks time. This show is using time travel to play out some really fascinating character stuff for its leads, and it doesn’t feel too much like a retread of the time-travel borks you’ve seen in the past. 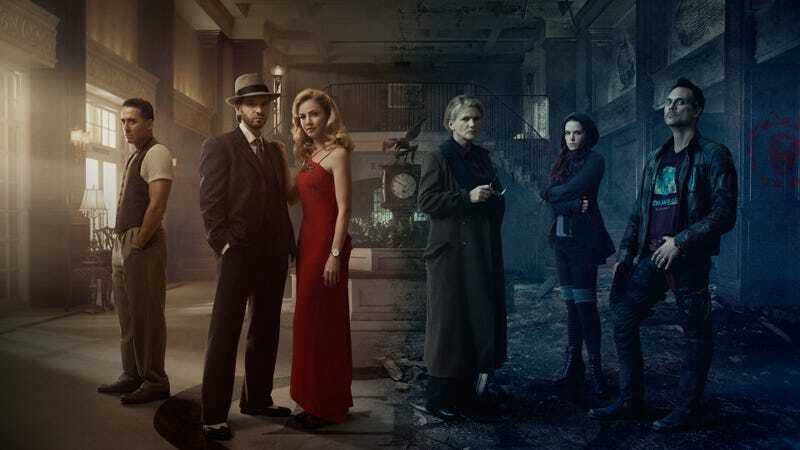 In particular, 12 Monkeys is feeling more and more like a worthy successor to Terminator: The Sarah Connor Chronicles and Continuum, two shows that used the ideas of time journeys and shifting futures to good effect. Many of the ideas that made Sarah Connor and Continuum so mind-blowing at their best are also playing out in 12 Monkeys, and it’s a huge part of what makes the show a crazy compulsive watch. This subgenre, the “coming back to the present from a dystopian/post-apocalyptic future” story, mixes the ideas of recovering from post-traumatic stress and dealing with the weight of an oncoming disaster. The juxtaposition of the past trauma and the future apocalypse—with the two of them usually being the same thing—leads to a rich stew of foreboding, triggers, anxiety, paranoia and dissociation. The time-travel to a pre-apocalyptic 2016 lets you sidestep a lot of the clichés of the post-apocalyptic dystopia, and adds to the sense of huge, insane stakes. But most of all, these stories are a character study in what it’s like to be so much a part of an oppressive system that you can’t even imagine or comprehend life outside it. For the traveler from dystopia, the awful future frequently seems inevitable, precisely because he or she has been shaped by it and can’t see past it. In addition to time travel, the other major element that gets deepened in season two of 12 Monkeys is the mythos—and this is much more of a mixed bag. We learn more about the Witness, the mysterious leader of the Army of the Twelve Monkeys. And we get to know the Messengers, those 12 blue guys who showed up at the end of season one. Jennifer Goines, the mentally damaged girl who seems destined to unleash the plague, turns out to have a more complicated role that makes some of her random doggerel in season one turn out to be much more literal. The more complicated mythos is mostly pretty interesting, but parts of it have a certain “making this up as we go along” feeling, and there are a few reveals that are either confusing or head-slapping, or both. The show is trying to paint a huge canvas, with a lot of weird stuff splashed across it, and those sorts of enterprises have an incredibly high failure rate—just look at Continuum, or dozens of other shows that got carried away digging a deeper and twistier rabbit hole, only to get lost along the way. Serialized television, it turns out, doesn’t do that well with complicated, endlessly elaborating mythologies—and some moments in season two of 12 Monkeys leave me apprehensive as to just how well season four or five will hold up. That said, this show’s second season is (based on the first eight episodes) a total insane blast. And the characters, who were mostly great in season one, are all a lot deeper this time around. There’s a fascinating role-reversal in the relationship between Cole and Dr. Casssandra Railly, the doctor in 2016 whom Cole enlists to stop the plague—now the once-ruthless Cole is having qualms about going to extremes for the mission, while Railly is willing to commit almost any atrocity. Ramse goes through a number of fascinating changes. But the show’s most memorable character, and the one most directly affected by time-travel shenanigans, turns out to be Dr. Jones (Barbara Sukowa), whose arc this season is almost worthy of Fringe’s Walter Bishop. In fact, that’s probably a good comparison to leave you with. If you obsessed over Fringe and kept rooting for the Bishop family to have some improbable happy ending, then 12 Monkeys has definitely become must-watch television. It’s that good. Just be warned—it’s pretty damn addictive. 12 Monkeys is back tonight at 9 on Syfy.